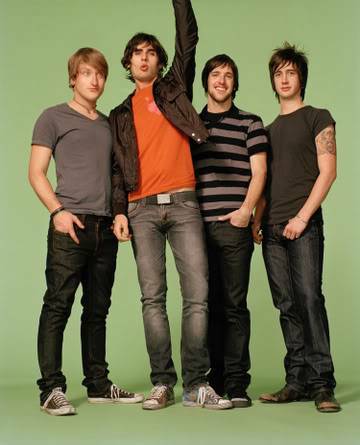 The All-American Rejects is an American rock band from Stillwater, Oklahoma, formed in 2001. The band comprises lead vocalist and bass guitarist Tyson Ritter, guitarists and vocalists Nick Wheeler and Mike Kennerty, with drummer Chris Gaylor. The All-American Rejects have released three studio albums in over eight years as a band. Their debut self-titled studio album, The All-American Rejects, was originally released in 2002, producing the successful single "Swing, Swing".The album went on to sell over one million records in the United States; being certified platinum by the RIAA. The band's second album, Move Along, brought the band more mainstream success. The album produced three hit singles; "It Ends Tonight", "Dirty Little Secret" and "Move Along". "Dirty Little Secret" and "It Ends Tonight" reached the top ten on the Billboard Hot 100, with "Move Along" peaking at number 15. "Dirty Little Secret" was also accredited platinum with one million sales in the US. The album Move Along, was certified double platinum in the US by the RIAA. The All-American Rejects' third album, When the World Comes Down, was released in late 2008. The first single "Gives You Hell" garnered much attention, with the song peaking in the top ten of the Billboard Hot 100 and Pop 100 charts, as well as in the top twenty of the UK Singles chart and number three on the Australian ARIA Singles chart. Any fans, I got into these guys after i saw FOB and to be honest they are just so good. There songs just grab my attention in a unique way and there massive hooks which are addictive. My favorite track of theirs is 'Gives You Hell' Or 'move Along'. Two very different songs yet two great pieces of work. Anyone like em, if not check them out. Also little fact, The lead singer / Bassist 'Tyson Ritter' was actually born at a Van Halen concert. They're a decent enough band that I can listen to them. As far as being a fan of theirs though. Nope. I do like Gives You Hell though, it's a pretty decent song. I've only heard one song from the All-American Rejects, 'Dirty Little Secret' and I thought it was pretty good. I like catchy tracks and that's certainly one of them so maybe I'll look into downloading some more of there stuff soon. Have you never heard 'Gives You Hell'? That was like the most played song on the radio in the last 3 months, I will put up a video in the music video section. Check it out.